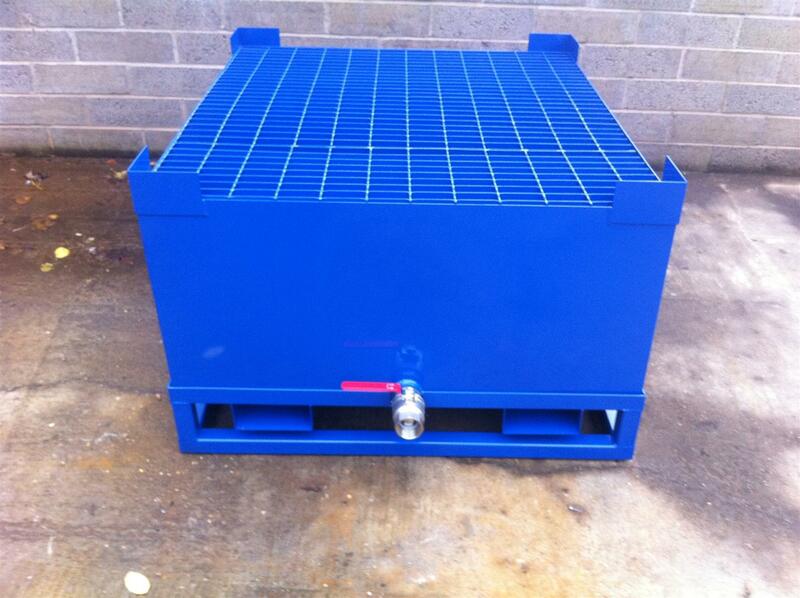 Design and manufacture custom size IBC Bund to suit sump pallets to drawing number: 2012-06-9304. The station will be accessible by forklift truck from the front and rear for efficient handling. A drain tap on the back of the bund will enable it to be emptied in situ instead of having to move the whole unit. The bund will be fabricated from 3mm mild steel plate which will sit on a box section and angle base frame and feature two levels. The large upper level will carry the sump pallet and be angled forward to ensure easy drainage of the sump, it will also have corner supports to securely locate the pallet. The lower level is to carry a bucket and tapered back so it can be easily lifted without having to over reach. Both levels will have removable open grid tops to allow access for cleaning. Approximate overall size 1500mm (L) x 1200mm (W) x 750mm (H).